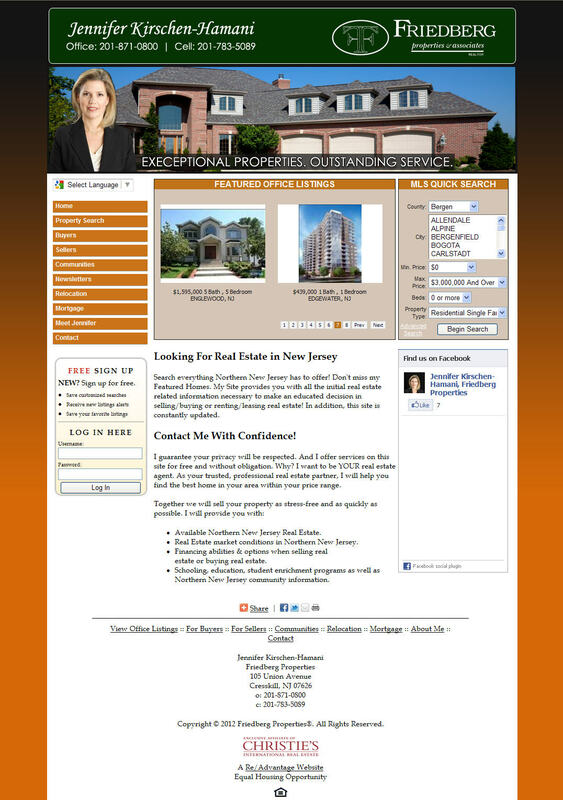 When Jennifer needed to have her website redone she came to the experts in Real Estate Web Design. Jennifer’s current website had an outdated look, was not attracting new prospects and her IDX search was not integrated into her Client Management System. Jennifer was looking for a firm that could give her a fresh look, leverage the latest technology and design concepts as well as provide a totally integrated content and lead management system. Based in Fairfield, New Jersey, RE/Advantage is a leading provider of real estate technology tools. RE/Advantage serves Brokerages, Agents, Boards, and MLS’s with web design, back-end management, member services and consulting. RE/Advantage provides easy to manage and fully customizable web sites and IDX solutions that helps real estate professionals with their online presence. RE/Advantage also provides Boards and MLS’s with public website services and member management tools. For more information please, please visit www.readvantage.com or call us at (877) 791-4825. Next postAre You Losing Buyers on Your Real Estate Website? You have been doing a great job, I am happy that some of the comments which I read hear proved to be very helpful to me!